Something kind of notable happened this week! I've known it was coming for many months, questioned my own good judgment at saying "yes" more than once, yet when it came right down to it, I was excited, and it all turned out really well. I gave my first modern quilting lectures. The Fidalgo Island Quilters had invited me to both of their meetings on Monday to share about "Creative Use of Neutral Fabric." Does that title ring a bell? Yup, it's precisely the name of the award my quilt Common Affection won back in 2013, and specifically the reason I was asked to visit FIQ. 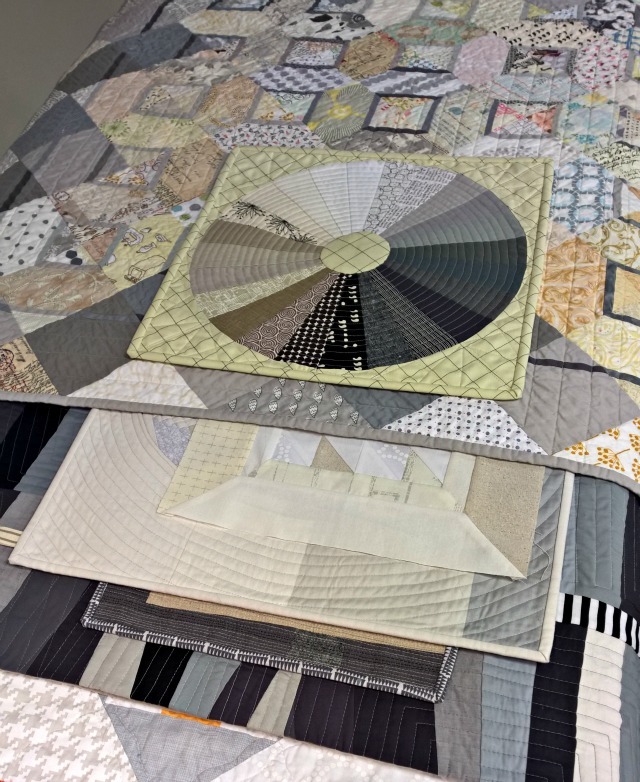 So the last few weeks I've been working on my presentation, which included many of my own quilts that incorporated neutrals as well as an assortment of works by other quilt artists. 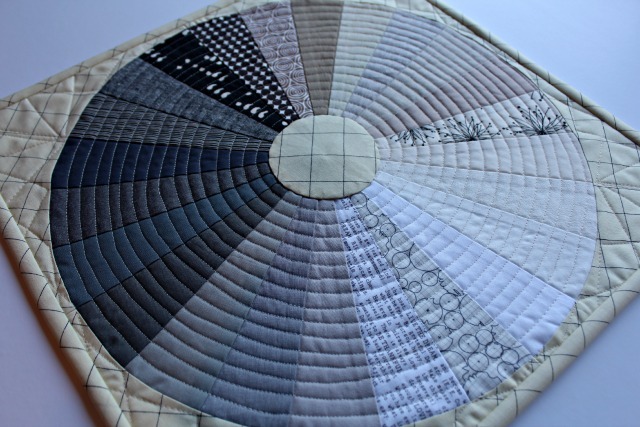 As a way to explain neutral fabrics to the group, I thought it would be fun to create a fabric representation, and The Motley Wheel by Nicole/mama love quilts came to mind. If you remember, I made my own rainbow Motley a while back, and I recalled it being a pretty quick project, so starting it 2 days before my presentation wasn't totally unrealistic. I chose to pull all the wheel fabrics right from my scrap basket, which was an added bonus, even though it gave it a bit of an eclectic look. But the assortment included solids, chambrays, linen blends, prints - together, a good example of the versatility of neutrals. For the background and binding, I chose another neutral print, from Carolyn Friedlander's Doe, and for the backing, "Cubist Perception" from Pat Bravo's Etno. I quilted it all the same as my original Motley - a spiral for the wheel, and a starburst of sorts on the background. I do wish I'd cut out the center bulk after appliqueing on the center circle and before basting, but I just plain forgot. Even so, the Neutral Wheel was a fun little addition to my presentation. And boy was it a treat to share my love of neutrals with FIQ. They were so welcoming, so appreciative, and yes, a little in awe. Indeed, a very good time. 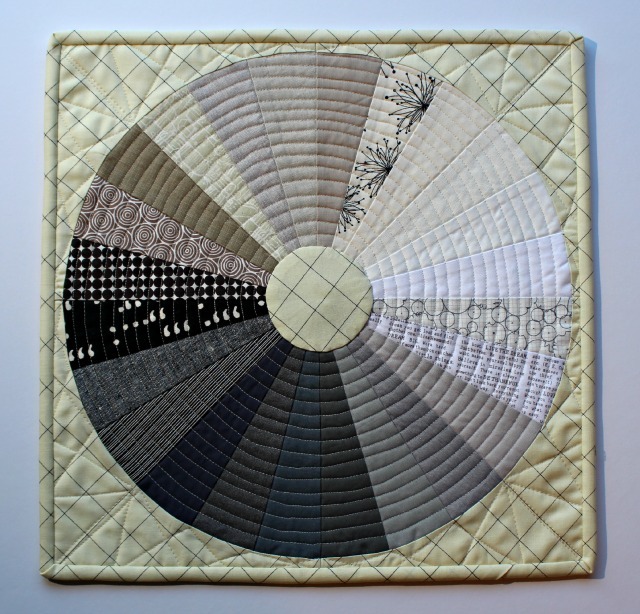 I've created a Neutrals board on Pinterest - most of the quilts I shared in my presentation are there, and more . . . Linking up with Finish It Up Friday, Scraptastic Tuesday, and Fabric Tuesday. Похоже на виниловую пластинку. Приятная цветовая гамма. It would be fun to hear you talk about this. 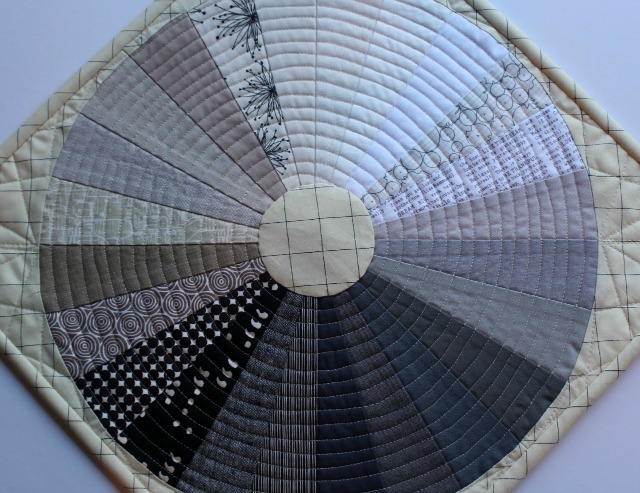 The wheel is a great idea and a lovely little quilt. Good for you Debbie. Adventures await! Currently I am obsessed with neutrals and textures. Glad to see I am not alone! I really love the neutral wheel and may make one myself!!! Congrats on your first lecture. love this one. hmmm maybe we need to get you to Texas to talk to us? I could easily get behind these neutrals...gorgeous! I love the neutral colorwheel! Congrats on the lecture, I'm sure you killed it and everyone came away with a new understanding of neutrals! How fun and what an exciting adventure! Do I see more speaking engagements in your future? Your quilt is just lovely too. Wow! Way to go Deb. I'm sure they enjoyed hearing you speak as much as you enjoyed sharing about your favorite passion! Very cool! Love how your quilted this as well as the fabric. Your neutral colorwheel is great idea ! I love neutral fabrics ... The pinterest board is really interesting. Thank you for sharing. 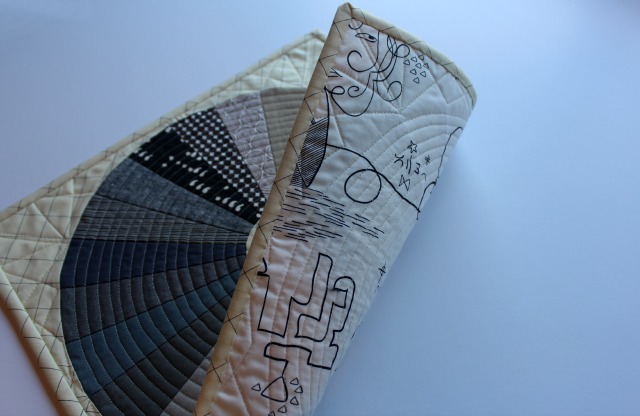 I love this piece and the quilting on it is perfect! Now I want to hear your talk too! Great wheel - off to see that pinterest board. Thanks for linking up to #scraptastictuesday! Oh my goodness, this is so beautiful! I don't know how I missed it when you originally posted. But wow! Great job all around, Debbie.